Copyright © 2019 Hong Kong Academy of Medicine Press. All rights reserved. The Asian Journal of Gerontology & Geriatrics (AJGG) is published by the HKAM Press on behalf of The Hong Kong Geriatrics Society and Hong Kong Association of Gerontology. It is circulated to all members of both Societies. The Journal is published two times a year in June and December. 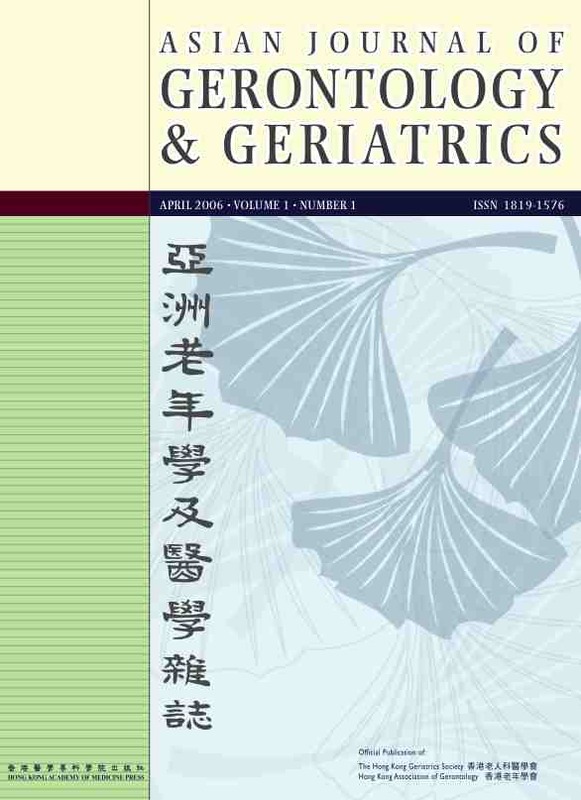 The circulation volume is more than 500 copies and is distributed locally to members of The Hong Kong Geriatrics Society and Hong Kong Association of Gerontology, physicians, physiotherapists, social scientists, all private and public hospitals, nursing schools and tertiary education institutions; internationally to Geriatrics organizations, Gerontology organizations, and renowned geriatricians and social scientists in Gerontology. Correspondence regarding permission to reprint all or part of any articles published in this Journal should be addressed to the The Hong Kong Geriatrics Society and Hong Kong Association of Gerontology. This consent does not extend to other kinds of copying, such as copying for general distribution, for advertising and promotional purposes, for creating new collective works, or for resale.